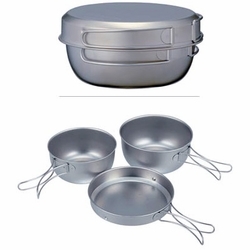 The Snow Peak Titanium Cookset is a fine example of Snow Peak's world-renowned expertise in crafting multi-purpose, compact, titanium cookware. Its unique design allows you to use the set as a pot and a cup. Titanium construction makes it lightweight and corrosion-resistant, with virtually no metallic smell or taste.